Do we receive a Certificate of Destruction? Yes, you receive two! One on your work order and one on the invoice. Yes, we sure are! We are licensed too! Do you belong to NAID? Yes, Shred Wise has been a member in good standing since we were founded in 2006. Can’t we save money by shredding it ourselves? In these tight economic times saving money and being more productive is on everyone’s mind. If you have accumulated just 5 standard file boxes, (30 pounds each), using a typical office shredder it would take your employee approximately 16 hours to complete. This does not include the time to separate files and remove clips, rubber bands and staples. Your employee’s skills and time are key to the success of your business. Why shift their productivity to the manual, time-consuming task of shredding when Shred Wise can accomplish in less time? Using Shred Wise can result in a higher return on investment (ROI) for your business and life! What happens to my shredded documents after being shredded? To eliminate the risk of any attempt at “document recreation,” all shredded documents are inter-mixed with thousands of pounds of other shredded documents. The material is them transported to a secure recycling facility where it is recycled. Do I need to remove staples, rubber bands, or paper clips? No, our truck will shred all of these items. How do we keep our documents safe between service calls? All of our recurring clients are provided with free, locking security consoles or bins. How long will it take to shred our bin? Well, our trucks shreds 6,000 pounds of paper per hour, that should tell you something! 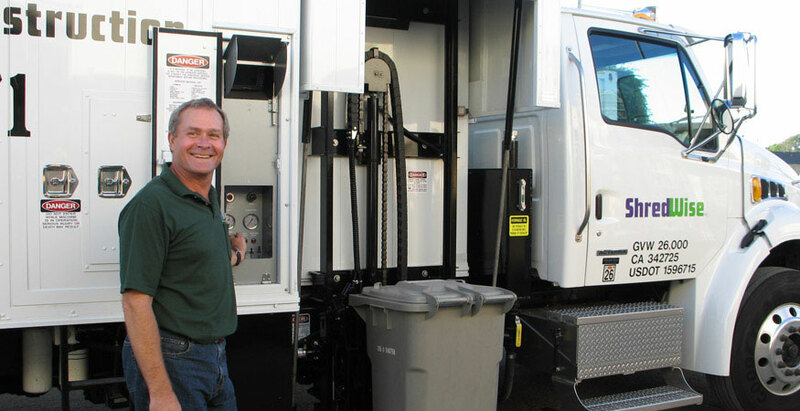 Our trucks are the most advanced, environmentally friendly, mobile technology available today. One bin of paper takes approximately 2 minutes to shred. Each ton of shredded/recycled paper saves approximately 17 trees!! ShredWise is the greatest company! We have been a client for about a year and a half and I do nothing but continue to sing their praises. The service is impeccable! They are "Johnny on the spot" for all of our extra projects that need shredding. And who doesn't like to see big machines work! It is nice to have one less thing to worry about these days!